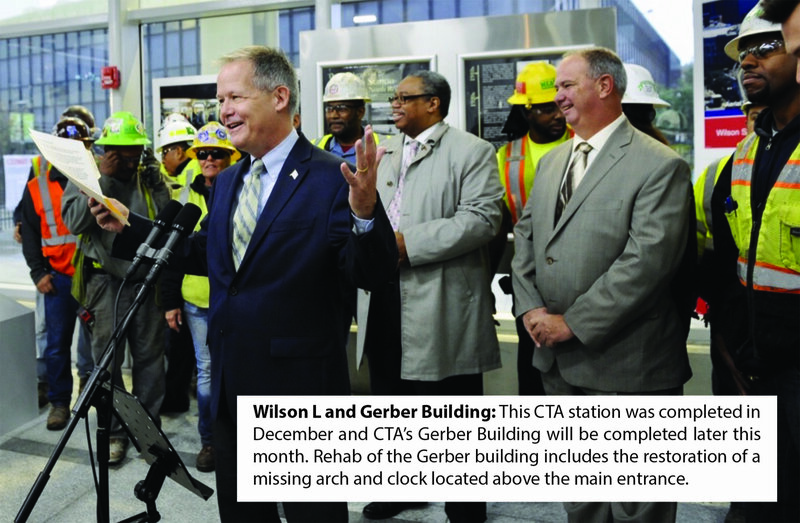 The past year has been especially exciting with the completion of major projects that have helped transform the 46th Ward. We’ve not seen this type of renaissance in generations, and it took many years of planning to get us where we are today. There has been a lot of dust and many road closures along the way, but much of that is now over and we can enjoy the benefits. 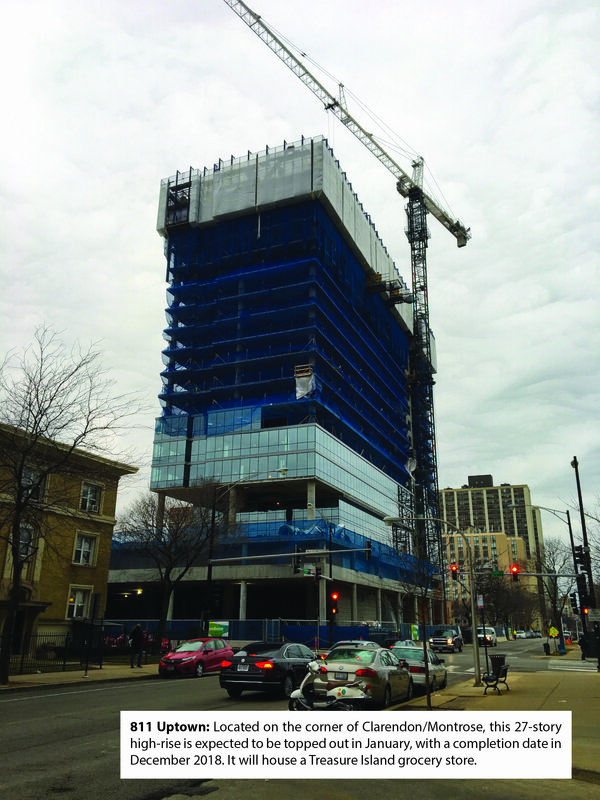 The number of new businesses in the 46th Ward nearly doubled from the previous year. Not only do new businesses provide job opportunities, but they also provide residents with more shopping opportunities. Most of these are independent, small businesses, which further adds to the unique character of the 46th Ward. 734 W. Sheridan: This 8-story building replaced the former gas station at the corner of West Sheridan and Broadway and is expected to be ready for occupancy by early June 2018. 3833 N. Broadway: This 7-story building will have geo-thermal heating, which is the most environmentally friendly way to heat a building. The expected completion date for commercial tenants is this summer, and move-ins for the apartments will start in the fall. Morningside, 4525 N. Kenmore: 64 rental units will be available in the first quarter of 2018. 4430 N. Sheridan: This 4-story mixed-use development is expected to be completed by the end of summer 2018. The Montrose, 4334 N. Hazel: The developer has plans for a series of townhomes on the perimeter of their deck. The project has been placed on hold, and the developer expects to be able to provide a timeline later in 2018. 931-33 W. Belle Plaine: This apartment building is expected to be completed in early spring 2018. 1050 W. Wilson: FLATS is securing financing and hopes to break ground in 2018. 1124 W. Wilson: Developer is working with the current residents and the city to first relocate the residents to affordable apartments before a gut rehab begins in 2018. 4500 N. Broadway: Aldi will receive a major renovation, including adding a front entrance facing Broadway. The overhaul will make the store more pedestrian-friendly and allow more eyes on the street to enhance public safety. Clarendon Park Community Center: Last September, Uptown residents provided feedback about improvements they’d like to see at Clarendon Park Community Center, 4501 N. Clarendon. The center is slated to undergo an extensive $6.1 million renovation, prompted by money secured from the 811 Uptown development. Attendees at the open house used large graphics of the building to cast votes on interior room renovations. Each attendee was allowed three votes. On the ground floor, the gym received the most votes (37), followed by the game room (14) and fitness room (12). Other sections on the ground floor, such as the model railroad and early childhood areas, received 10 votes or fewer. On the first floor, the multi-purpose room received the most votes (48), followed by the dance room (24) and recording studio (13). Other areas on the first floor, such as Kuumba Lynx office and a meeting room, received 10 votes or fewer. The Park District is in the process of securing a design team for the project. Once a team is in place and the assessment and design work have been completed, another Open House will be scheduled to present the final plan for the renovations to the community. The timeline for the project has not been determined yet. The project will be funded by a $4.6 million contribution from the Clarendon/Montrose Tax Incremental Financing (TIF) District, and $1.5 million from the Chicago Park District. These long overdue repairs will bring the community center back in compliance with city building code. Gill Park Playlot: The park at West Sheridan and Broadway is slated to receive a new playlot, with construction expected to begin in spring. Grow Uptown: My office is partnering with Peterson Garden Project and Neighbor Space to install a community garden on the parcel of land in front of the former Stewart School. The project will begin in the spring. Scholarships will be provided to families with lower incomes and some of the vegetables that are grown will be donated to local food pantries. 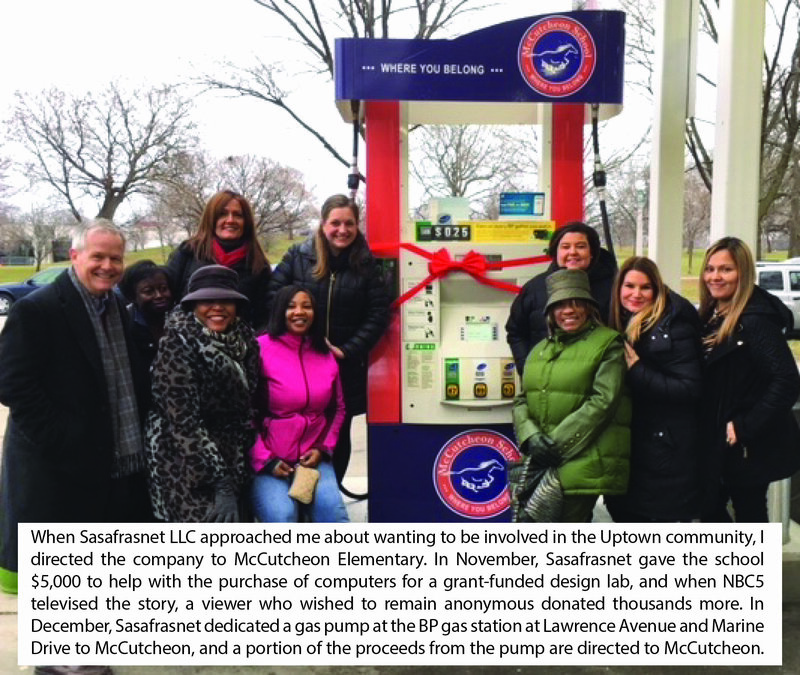 This project is in keeping with a promise made by Chicago Public Schools to ensure there was benefit to the community when the property was sold. Broadway Youth Center: This is program of Howard Brown Health Center, provides social services to LGBTQI youth, and moved to the 46th Ward earlier this year. Apna Ghar: This domestic violence shelter opened in January 2017 and is the only such shelter for immigrant women in the entire Midwest. In September, I pushed hard for both McCutcheon and Courtenay to be awarded the Becoming A Man (known as BAM) Program for male youth. In October, both schools learned they had received the program. Friends of the 46th Ward Schools continues to work with the Bill & Melinda Gates Foundation to get matching dollars when they raise money for our 46th Ward schools. In 2018, I will launch regular, ongoing meetings with members of 46th Ward Local School Councils, so we can work together to address issues and concerns. A $6 million streetscaping project on Broadway (from Gunnison to Leland) is now 90% complete, and the remainder of Broadway from Leland to Wilson will be completed before summer 2018. For the first time in decades, the sidewalk on Lawrence near Broadway is compliant with the Americans with Disabilities Act. The intersection of Clarendon and Broadway had a complete overhaul to make it safer for both pedestrians and bikers. Bike lanes were installed on Leland beginning at Clark, and will eventually lead all the way to the lakefront bike trail. One section of the bike path was installed between Uplift High School property, and it included a way to address stormwater runoff behind the school, with plans for a butterfly garden and shade trees. The replacement of century-old water mains on Broadway in Lakeview and sections of Clark Street in Uptown was completed, which also allowed for the complete repaving of those streets, including new markings. Along the lakefront bike trail, work should be completed by the second quarter to separate the bike trail from the pedestrian trail. The bike trail will be moved further east to make it easier and safer for bikes to cross Montrose, Wilson, and Lawrence. Bike riders will be able to more safely head east to the Park on both Lawrence and Wilson with the installation of bike lanes that will connect them to the bike path in the park. In 2016, I successfully pushed for a housing-first model of care to address the encampments located under two Uptown viaducts. A total of 75 people received housing, some for the first time in many years. In 2017, the Center for Urban Research & Learning out of Loyola University created a report entitled The Encampment that documented the experiences of the people who were housed during this pilot project in an effort to learn from their stories. One person who had been living in a tent for a long time remarked, “I feel at home, finally. I mean, I can stand up without having to bend over the side of the tent. I can actually go to the bathroom. You know I can cook some food, besides firing up the grill.” I continue to work with my colleagues and advocates to make the Housing First model a priority in Chicago. A mural at the Bezazian Library was restored. A large mural of colorful fish was added under the Montrose viaduct. In November, we got a new mural with a jazz theme on a CTA wall across from the Lawrence L stop. A 17-foot circular sculpture that will be lit up will be installed in front of the Riviera Theatre next spring. A large sculpture of a phoenix will be added at the Broadway/Montrose/Sheridan intersection during the first quarter. In 2016, I pushed for the hiring of 1,000 more police officers for the City of Chicago within the next two years, and we are on target to meet this goal. Motorcycle noise has been an ongoing problem along Lake Shore Drive. I convened a meeting with neighbors and other elected officials to discuss possible solutions to this noise and safety issue. As a result, State Rep. Sara Feigenholtz passed state legislation that will allow the City of Chicago to start measuring noise on Lake Shore Drive, which is critical to assist us in our efforts to curb the racing of motorcycles. The series of hurricanes in 2017 had a profound effect on animal shelters that experienced severe damages.I orchestrated a pet supply drive at Camp Wiggles that helped provide needed supplies for these animals, some of whom had been transported to Chicago for adoption. I worked with the Park District to secure all of the necessary permits for the new Mutt Jackson dog wash at the Montrose Dog Beach. This site features self-service dog wash stations, dog-training sessions with Urban Pooch, and much more. Friday, April 20, 2018, 2 – 4 p.m., free shredding event at our office. A mobile vehicle parked outside of 4544 N. Broadway will safely and securely shred your documents, free of charge.